Laboratory of Low Temperature Materials Science (Center for Low Temperature Science) has found that pure single crystalline silicon become ‘soft’ at very low temperatures in collaboration with Niigata University, Fujitsu Ltd and Kyushu University. This softening is measured by an ultrasonic method and can be explained in terms of the interaction between atomic vacancies and ultrasound. Ultrasonic measurement has found to be a hopeful probe for evaluating the vacancy concentration in defect-controlled-wafers in large diameter. Results of the research have been published in the meetings of the Phy. Soc. Jpn. (Matsuyama), Jpn., Soc. Appl. Phy. (Setagaya) and E-MRS 2006 (Nice). 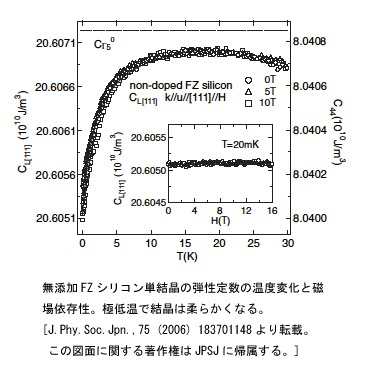 JPSJ has published a part of the results as an article (vol.75, 044602, ‘06). Comments and information in English are found in JPSJ On-line (COMMENTS AND NEWS, Apr. 10, ’06) and EE-Times On-line (Mar. 27, ’06, ID=183701148).